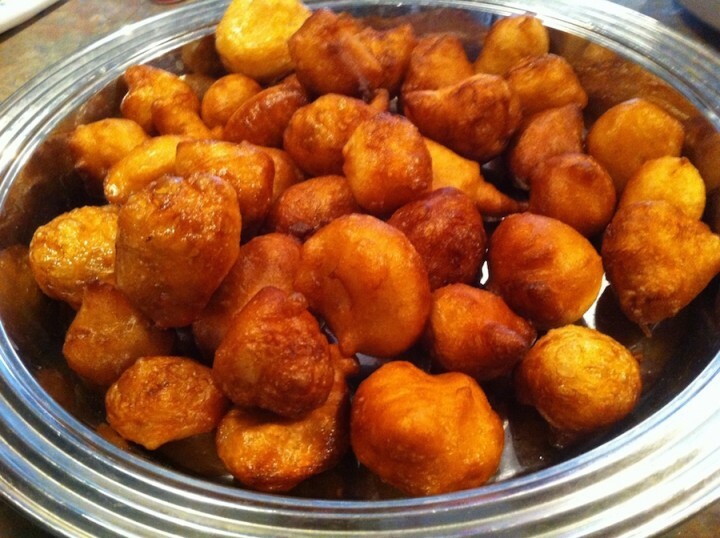 Puff puff is the Nigerian name given to deeply fried dough. It is called Puff Puff because of its spongy nature and it is pronounced /kpof-kpof/. Though common in Nigeria, Nigeria is not the only place you can find this delicacy as you can also find it is Cameroon, Ghana, Congo and Liberia. In these countries it is called different names too. Like Bofrot in Ghana, Mikate in Congo, Beinye in Cameroun, or Kala in Liberia. Let’s find out how to make puff puff. Making puff-puff follows quite a straight forward process as it involves mixing the ingredients well, before frying. Mix yeast, salt, sugar until you have a good blend and set it aside for 5 minutes, then add the flour and mix thoroughly until it is smooth and the ingredients blend thoroughly. Afterwards, let the mixture rise for 45 minutes to 1 hour. Get a very large sauce pan and pour in your vegetable oil, until it is enough to cover the amount of puff puff which you will be frying at once. Remember, puff puff is to be deep fried. Next, you heat the oil till it is moderately hot. Test to make sure the oil is hot enough by putting a drop of the mixture into the hot oil. If it is not hot enough, it will stay at the bottom of the pot. If it is hot enough, it would rise to the top. Fry for a few minutes, until a side facing the oil is golden brown, then turn upside down using a large spoon. After the colour is evenly spread, take it out of the oil and drain the excess oil. You can then roll the excess oil in sugar.